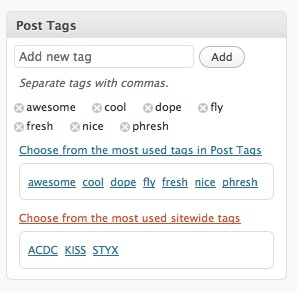 A recent project of mine has been to improve the “Choose from the most popular tags” button that’s built into the Wordpress edit post screen. The default behavior is to find the most frequently used tags from the current blog. My goal is to add a link that lets you select from frequently used tags across the entire Wordpress MU installation. It’s an idea that Matt Gold gave me. Aside from being kind of gimmicky and neat, such a feature might facilitate the emergence of a more unified folksonomy in a community. In other words, the ability to see what tags other people are using for their posts makes it more likely that I’ll use the same tags that you use when we post about similar things. In this way, we can avoid having people tagging their posts “Wordpress”, “WP”, “Wrdprss” as if these were different things. It looks like the developer of Simple Tags is going to be working this sort of functionality into an upcoming version, but it’s not nearly as fun to just use someone else’s version if you can hack one out yourself. STS starts off with the plugin WordPress MU Sitewide Tags, which I blogged about recently. Conceptually, the idea is simple. Sitewide Tags creates a blog that aggregates all posts from across the installation. From the tags blog one can then collect tags that reflect all sitewide activity. To make STS work, then, one simply has to duplicate the core WP tag suggester, altering it to pull the most popular tags from the tags blog, rather than from the current blog. get_terms_custom is really the heart of STS. It’s a modification of WP core’s get_terms (in wp-includes/taxonomy.php) that allows for an additional argument: blog_id. This allows you to pull taxonomy terms (like tags and categories) from any blog on a WPMU install. sitewidte_tags_selection is the PHP function that writes to the header of the WP admin screen the jQuery function tagCloud2. tagCloud2 is the function that listens for the user to click on the “Choose from the most popular sitewide tags” link, and then posts the AJAX request for the proper tags. STS has two more parts, one of which could probably be moved into the plugin proper, and one of which probably has to remain a core hack. I’ll cover them in turn. Don’t forget to replace “28” with the blog_id of your tags blog. I am well aware that there are ways to add ajax responses in plugins, i.e. without hacking the core, but for the life of me I couldn’t get it to work. I imagine part of the problem is that back in tagCloud2, I’m replicating the core’s ajax syntax, while a plugin’s syntax has to be more explicit about where’s it’s sending its requests. (That’s what wp_ajax_ is for, I think.) So I’m chalking this one up to my own ineptitude and the fact that I have no idea how to work computers. Be sure that each instance of tagcloud is changed to reflect the new ajax call (in my case, tagcloud2). I think that STS has some potential to be really cool, especially if used in a community that is large enough for rich folksonomies to emerge. If you’ve got any suggestions about how to make it better, or how to fix any of my stupid errors, please don’t hesitate to leave a comment! Date: August 21, 2009 · Author: Boone Gorges. Okay, now *this* has a lot of cool potential. 😀 I’m wondering if this will be made easier when the upcoming custom taxonomy system rolls in. Erstmal vielen Dank – das war genau das, was ich gesucht habe. Leider funktioniert script nicht in WPMU 2.84, oder ich bin zu blöd… Was tun..? First of many thanks – that was exactly what I was looking for. Unfortunately, no script works in WPMU 2.84, or I’m too dumb … What to do ..? Hi Jo. You might start by having a look at the most recent version of the hack, which can be found here. Make sure that you follow the readme.txt instructions very carefully. If it still doesn’t work, let me know exactly what’s happening. Is it that the link isn’t showing up on the edit-post screen?